When it comes to casters for warehouse equipment, pneumatic tires are an extremely popular choice. These casters typically have a metallic hub with some form of rubber tire that has been molded to it. The tire is either then inflated with air or filled with some other, impact-absorbing substance, such as foam. If you work on bumpy, uneven terrain, or transport heavy or fragile loads, then pneumatic casters are the right choice for you. The air or foam within the wheels will absorb shock from rough terrain or uneven floors, preventing damage and making the load easier to transport. You’ll make your employees’ lives easier if you invest in pneumatic casters – that much is certain. While the majority of casters will spend their lives operating indoors, some applications will require them to be used outside as well. There is no point in spending money on casters suitable for indoor use, then another set of casters suitable for outdoor use, when you can select pneumatic casters that are totally adept to be used in both areas. If you load on or off pavements or roads for example, then you’ll find that pneumatic casters will be extremely effective. You may not think that ‘noise pollution’ is that much of a problem, but if you work in a noisy environment, then excess noise can really cause issues and even lead to psychological problems. In order to keep the noise generated by your casters down to a minimum, it will pay in the long run to invest in pneumatic casters. The rubber tread and shock-absorbing attributes mean that they will always roll quietly as long as they are well maintained. It’s not all good news when it comes to pneumatic casters – for example, the ‘start force’ is greater with rubber wheels, and maintenance can be high as the wheels have to be kept inflated – but the advantages will far, far outweigh any disadvantages that pneumatic casters may have. There are many models of pneumatic casters we can supply for you. 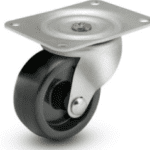 For example, the pneumatic wheel casters from Caster Concepts offer load capacities from 320lbs. up to an incredible 7,260lbs. They are made from hot forged steel with double row ball bearing swivels, blessing them with a long and productive life. They’ll work extremely hard for you while protecting your floor, and will roll over debris and other obstructions with a minimum of effort. For more information about what we can do for you at Douglas Equipment, please don’t hesitate to contact us. Any member of our sales or support team can be contacted by phone at 1-800-451-0030 or by using our online contact form.